WITH ITS UBIQUITOUS Hector Guimard ‘entourage’ entrance, the Métro station Cité is the only Métro station on the Île de la Cité, one of the two islands on the Seine within the historical boundaries of the city of Paris. The entourage entrance was the most common of Guimard’s Métro entrances. Built in the Art Nouveau style the entrance has waist high cast iron railings around three sides with symmetrical raised orange lamps designed in the form of plant stems, with each lamp enclosed by a leaf resembling a brin de muguet, a sprig of lily of the valley. Between the lamps is the classic Metropolitain sign. Of the 154 entourage Métro entrances built, some 84 still survive on the Paris streets. With the Cathédrale Notre-Dame de Paris on one side and the medieval gothic chapel, Sainte-Chapelle, the Conciergerie (a former prison) and the Palais de Justice (all formerly part of the Palais de la Cité, a Royal Palace from the 10th to the 14th century) on the other, Cité Métro station lies at the historical centre of Paris. The station is on Line 4 of the Paris Métro system, the line that travels 12.1 km across the heart of the city connecting Porte de Clignancourt in the north and, since 2013, Mairie de Montrouge in the south. Until the extension to Mairie de Montrouge was opened, the southern terminus of Line 4 was the original terminus, Porte d’Orléans. Métro Line 4 was the first line to connect the Right and Left Banks of the Seine via an underwater tunnel built between 1905 and 1907. At the time, this was some of the most spectacular work carried out on the Paris Métro system. Crossing the Seine was achieved using caissons, assembled on the shore and then sunk gradually into the river bed. The metal structures of the two stations, Cité on the Right Bank and Saint-Michel on the Left Bank, were also assembled on the surface and then sunk into the ground to their final location. The Seine crossing was commissioned on 9th January 1910 … only to be closed a few days later, a victim of the great Paris flood of 1910. Cité Métro station was opened on 10th December 1910. Unusually for the Paris Métro system, the station only has one entrance, at 2 Place Louis Lépine and, unlike other stations on Line 4, the platforms are 110 m in length, longer than the 90-105m platforms at other stations. Because of the station’s depth, passengers must walk down to a mezzanine level, which contains the ticket machines, and then down another three flights of stairs before reaching platform level. This is fine on the way down but, as I know all too well, it can be a challenge on the way up! 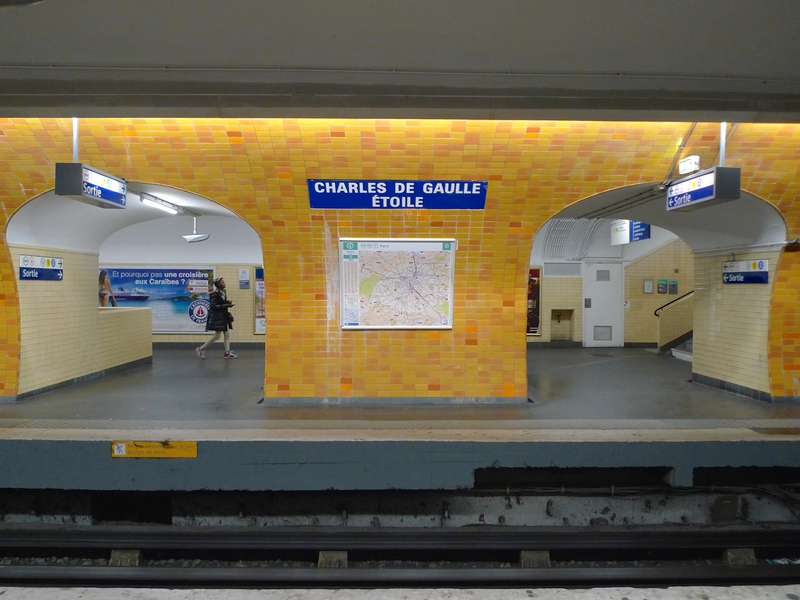 The walls of the station at the entrance at the top and along the platforms at the bottom are lined with conventional white Métro tiles but the decoration of the space in between is curious. Here, the walls are lined with large metal plates with oversized rivets. I have no idea when these were installed or why, but they give the impression of walking through a huge metal tank. The station platforms are lined with overhead lamps reflecting the style of the original station lamps. Until recently, Métro Line 4 had the distinction of using the oldest trains on the Paris Métro network, the MP 59. After serving for almost fifty years, these trains were withdrawn from service during 2011 and 2012 and replaced with the MP 89 CC trains from Line 1 when that line was automated. I began recording these sounds at the Cité Métro entrance in Place Louis Lépine, beside the flower market. I went down the steps to the mezzanine level, passed through the ticket barrier, and then descended two more flights of steps. From here, it’s possible to see and hear the trains passing below. I walked along the narrow passageway beside the riveted metal plates and down some more steps to the platform. Watching and listening to the MP 89 trains entering and leaving the station was quite nostalgic for me since I know these trains so well. When they operated on Line 1, the nearest line to my home, I rode on these trains almost every day for the best part of thirteen years. 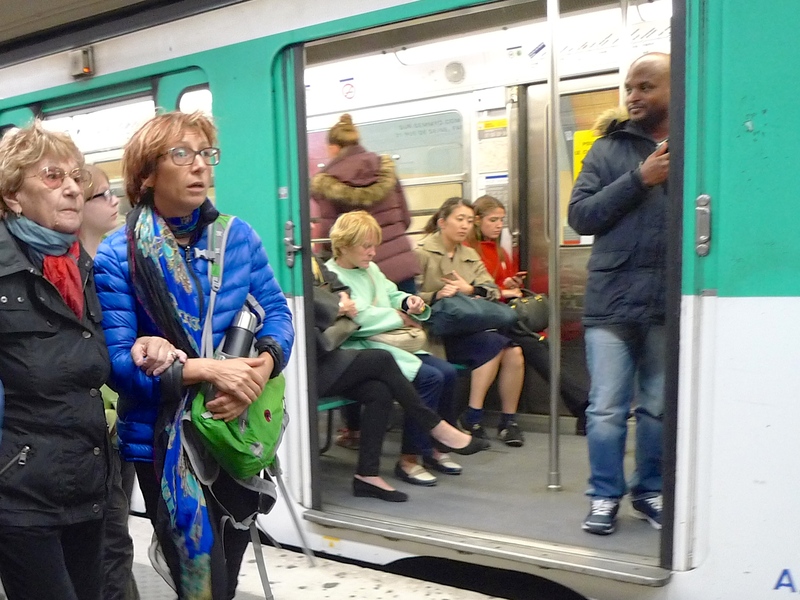 I was pleased to see my old friends again at Cité station busy carrying passengers on the second busiest Métro Line in Paris. Having savoured the atmosphere of the station, all that remained was for me to bid my friends adieu and gird my loins for the climb out of the station back onto the street. IT’S BEEN A WHILE since I last featured any street music on this blog but I now have the opportunity to put that right. Changing trains at the Métro station Charles de Gaulle Étoile the other day I came upon a street musician who is often to be found playing his xylophone on the platform of Métro Line 6, the line that follows a semi-circular route around the southern half of the city from Étoile to Nation. Getting a seat on a train on Line 6 at Étoile can sometimes be a challenge. A large crowd often assembles on the platform and I usually find myself forsaking the pleasure of listening to the music in favour of elbowing my way through the crowd in the hope of securing a seat on the arriving train. Which is a shame really because most of the musicians playing in the Métro stations are very good. It’s not generally known, but musicians who play in the Métro – at least those who play there legally – have actually been selected to play there following a formal audition process. The auditions were introduced because the Métro was becoming infested with itinerant so-called musicians who could barely scrape out a note from their battered violins or accordions. Now, some 2,000 musicians attend the auditions and the artistic director of the Musiciens du Métro programme and representatives of RATP, the Paris mass-transit authority, judge their performances. Only 300 of them will be awarded the coveted badge that lets them play legally in the Métro and so, with a potential audience of some four million passengers a day, that’s a gig worth having. When I was changing trains at Étoile the other day I had time on my side so I stopped to listen to the xylophone player, one of the successful badge holders, playing his music. And what a delight it was!